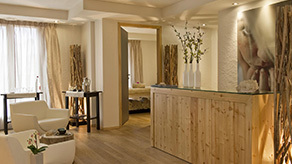 Discover the Cristal Spa in the Au Cœur du Village***** Relais & Châteaux Hotel in La Clusaz. When constructing the Hotel and Spa, Gaston Pollet-Villard our owner, wished to tell a little of his own personal story, the story of his previous career importing precious stones. He wanted to use these crystals and exploit their healing properties.You can find the crystals beautifully reflecting the light in the heart of our Hammam, a veritable crystal grotto.You can also find them on the ceiling of one of the treatment rooms, encouraging you towards total relaxation. The minerals in the Cristal Spa beautifully reflect the positive energy of this unique space in Savoyard La Clusaz. 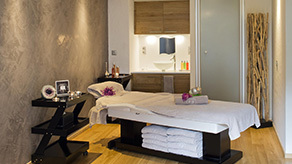 The entire team in the Spa encourage you to consult their brochure, and are eagerly waiting to welcome you.